Refined Country house near Venice with large park and parking. 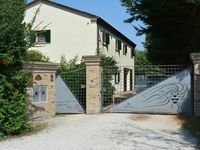 Property 2: Refined Country house near Venice with large park and parking. Property 23: CHARMING APARTMENT NEAR VENICE WITH PARKING G. S.
Property 35: Villa Une with garden, the perfect place for your holidays in Venice! Property 36: Casa Mafalda B & B. An historic Venetian Villa ideal for a family vacation or an intimate reunion. Property 38: An historic Venetian Villa ideal for a family vacation or an intimate reunion. Christina and Dario are wonderful hosts! They helped us with understanding Venice, places to eat, and what to do. They were gracious and were totally fine to work with us when we needed to leave our luggage for a few hours after check out. We loved it here as a group and would use this home again if we travel here again. Each room had their own bathroom and privacy. Would be excellent for children and families. Highly recommended! !